Huge malt balls, Tripled dipped in Milk Chocolate. Did I say Huge - about the size of a quarter, cause there is so much milk chocolate around the crunchy Malt center. 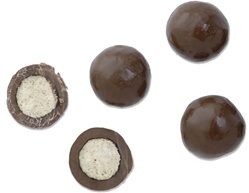 Like we tell our customers in the store, "We have the biggest malt balls in town".